For how many years have country fans from all across the world looked towards the two parallel one-way streets just east of downtown Nashville called “Music Row” with frustration, bewilderment, and even outright disgust, and then dreamed of a scenario where the whole mess could be switched out like a reversible sweater for what’s happening down in Texas, and pull off one incredible and unequivocal musical upgrade? For how many years have we stood stupefied as the biggest artists in Texas music remain in relative obscurity outside of the region while the next unproven guy with a snazzy haircut and no fan base gets plucked off the street and placed in front of a EDM producer and Auto-tuner, and all of a sudden has a hit on country radio? It’s not that Texas country artists haven’t enjoyed their shots at the big time in Nashville before. But they’re often too authentic, too independently-minded, too unwilling to compromise for Nashville, or for Nashville to compromise with them, resulting in disappoint and missed opportunities for both parties. Texas country artists have always come to the negotiating table feeling like they’re regional stars and Nashville has the upper hand. But this one is different, because Cody Johnson came to Music City in such a position of power and strength, he could demand full creative autonomy and still keep partial ownership via his company CoJo Music, yet still get the full muscle of a major Nashville label behind him. Dedicated Cody Johnson fans will disagree of course, but the Huntsville, TX native is not the best thing Texas country music has to offer. There are better songwriters, and maybe even more engaging live acts from the Lone Star State. But the one thing you can never question or mistake about Cody Johnson is that he’s country. If there was ever a chip off the old George Strait block, it would be Cody Johnson. If there was ever a guy less likely to succumb to country rap or some other popular trend, it would be Cody Johnson. He’s also proven wide appeal among the populous without compromising who he is. Cody Johnson may not be the best, but he’s the best candidate to walk proud shouldered into the soul-sucking machine that is Music Row, and not just persevere, but succeed and make the best of the opportunity. If anything, Cody Johnson’s major label debut Ain’t Nothin’ To It is just as country as his previous records, if not more. And it may be just as well-written, if not better. That’s the other concern you have when a Texas country artist finally gets his shot at the big time, especially if they already have a bevy of releases under their belt like Cody does. Did they shoot all their best bullets off getting there, only to arrive with nothing left in the chamber? That’s definitely not the case with Ain’t Nothin’ To It. 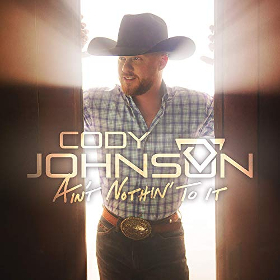 Blessed with a good variety of songs that fit many specific moods and tastes, if there was any specific takeaway from Ain’t Nothin’ To It, it’s that Cody Johnson is maturing at the right time. Some of his earlier albums were anchored by songs that were a little too self-ingratiating. This album is anchored by songs that speak to life and love, songs like “Noise,” “Fenceposts,” “Nothin’ On You,” and the current single that’s enjoying solid traction on radio, “On My Way To You.” Cody Johnson’s significant other will be impressed with this record if nobody else is. These are songs for adults, by an adult, but ones that are not saddled with over-sentimentality. They’re made endearing by Cody Johnson’s authentic, plain spoken Southern-isms underpinned by poetic intelligence, and penned perfectly for Cody’s Texas drawl and delivery. With 13 tracks you’re going to have a couple of miscues, and one of them feels like Johnson’s cover of “Long Haired Country Boy.” The rendition is fine, it’s just a strange choice from the short-haired, collared, and buttoned-up Cody Johnson, and his short haired, collared, and buttoned-up crowd. Also this song has taken on all kinds of weird tastes as Charlie Daniels has gone from the bridge between the hippie and redneck worlds, to trying to convince us that Iran might invade any moment and enact Sharia law. Cody’s “Doubt Me Now” feels like a twangy version of a Taylor Swift empowerment tune, though once again it’s hard not to be sucked in by the energy and passion with which it’s delivered. The record arguably reaches its high mark with the well-composed and sentimental “Monday Morning Merle.” Songs listing off the titles of other country songs are a dime a dozen these days, but one done well that still tells a story and encapsulates an emotion is rare. 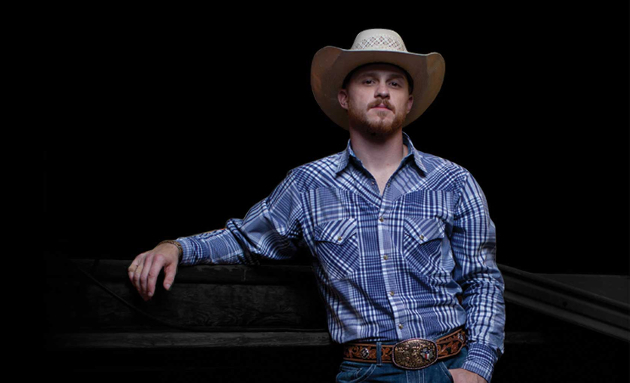 “Dear Rodeo” also stands out, and underscores what makes Cody Johnson a stand out himself. How many years have we been saying that we’re tired of all the fake personalities in country—all the Belmont University graduates in their fashion ripped jeans? Cody Johnson doesn’t just sing it, he lived it. He worked the oil rigs in Texas and went on the rodeo circuit, and he has the scars to prove it. The reason Cody Johnson has earned such undying loyalty from his fans is because he’s one of them. And Cody’s authenticity and the loyalty of his fans is what allowed him to walk on to Music Row for a deal, and walk off with a record like Ain’t Nothin To It, which doesn’t display any ground given, or any compromise. Cody Johnson didn’t need Music Row. Music Row needed Cody Johnson. You may not love Ain’t Nothin To It. You may find it a little too straight laced, or the songwriting a little shallow in moments. But it’s 100% Cody Johnson, and his fans will love it. Better albums will be released in country music in 2019. But just appreciate that Cody Johnson’s Ain’t Nothin’ To It is a mainstream release. It will go #1 in all of country music. Cody’s got a song that is doing well on radio. This is the moment that a truly independent Texas music artist went to Nashville, did it his way, and succeeded. It’s country, and cool, and twangy. And all of country music is better off for it. Big fan of Cody’s. Album is good, not great. Agree on Monday Morning Merle, as well as the overall rating of the record. Just happy he didn’t make too many concessions and stayed true to his sound for the most part. He’s going to get big, which is well-deserved. He’s put in his time. Yeah. Nothing to not like but….sounds like a thousand other guys reaching for the same gold. I could grab my geetar and join his band and with no rehearsal, just listing to the songs once, play my way through his material. The chord changes are entirley predictable, the hard rocking guitar solos are cliche….I don’t know, man. It’s a medicore affair. Best of luck to him. When in country music (especially this kind of country) are the chord changes not predictable? I’m very curious about this part of your comment. What sort of chord changes aren’t predictable? Do you have any examples? By TVZ? Not exactly experimental, is it? Good point and it serves as reminder as to how formula driven this genre is- three chords and the truth. BTW- I Drive Your Truck has a couple unexpected chord changes. I haven’t listened to the record yet, but just wanted to reply to this comment. M&G by Merle? What’s not predictable about it? It’s in F and i think there might be a secondary dominant chord or something. ROW by Wanda? That’s about as predictable as you can get. If a song doesn’t have a m7-5 or a #11, it can’t be real, interesting, or tell the truth! Srsly you guys! It’s a sobering day when you agree with Corncaster. I agree that the best part of album might not be the actual music itself, but it’s significance for other neo-traditional artists moving forward. I definitely prefer other CoJo albums and Red Dirt artists, but a success for this album might set a great model precedent for the type of record deal that he struck with Warner. Moving forward you would think that the major regional stars like Jinks, Aaron Watson, and Turnpike Troubadours could find similar success with that kind of partnership. I have really gotten into Cody Johnson since his last album, so I was stoked for this album. I was all set to buy it on vinyl, but saw in a couple other reviews that he wrote only a couple of the songs. I saved my money and ordered the CD, instead. The press releases all say that even though he signed to a major label, this album was “110%” him, he had creative control, etc. But I feel like I’ve heard this tune over and over and over – independent artist signs to a major label, claims to have given up no creative control, then lo and behold that artists stops writing most of their own music. I was waiting anxiously for this site to review the album. I’m glad to see the album is solid – I don’t doubt that it will be. Cody is a great singer. But for me, him not writing the songs really sucked away a lot of the excitement I had for this album. I love the cover of “Noise.” Has Cody always written so little of his records? Cody took part in writing 9/14 of the songs on “Gotta Be Me”. Can’t find the tracklist songwriters for the others. I’d bet he wrote a majority on the first two albums, Six Streams One Dream and A Different Day, but that’s just a guess. I’d rather see a certain other Cody from Texas enjoy this kind of success, but I really like Cody Johnson, he’s got a great voice and some real good songs, and it’s great to see an authentic guy like this succeed. Best of luck to him, I’ll be listening to even more of his music. Couldn’t agree more. Though Johnson is probably perceived as more polished, marketable and predictable than Jenks. Love his music and his authenticity. Keep it coming Cody. The album is good. Like the last album & the album before. You know what you get when you buy a CoJo album…solid as a rock country music. Not ultra-traditional country, not country rock or the flavour of the month sound Nashville is pushing. My highlights: “Understand Why”, “Dear Rodeo” & “Ain’t Nothin’ To It”. Classic lyrics, slow tempo…next hit for ZW. First full length country album by the 39 year old singer/songwriter. Country mixed with rock & blues elements. Great voice. Good songs like the first single “Jim Beam & Nicotine” (a minor hit in Texas) & the title track. Triston Marez will release his first EP soon (01/25). First single is the atmospheric “Where Rivers Are Red & Cowboys Are Blue”. Ray Scott will release his next project (EP – Honky Tonk Heart – 5 Tracks) in a couple of weeks (03/01). First single is the title track. I agree with your review. I feel it is a solid country album that might help Nashville see the benefits of signing more like him. I really like Cody Johnson and appreciate his music. He is not at the top of my list, but he is in the top 10. And I’m so glad he’s the one getting noticed because he deserves it, and I have a lot of faith he will continue to play his music. “Ain’t Nothin’ To It” is a lovely song. It is my favorite on the album. (Right now, I have played his album over and over.) I like it. I’m a big fan of CoJo. This style of music has always appealed to me even though I’m not from Texas and do not rodeo. I’ve just always loved the idea of Texas, it’s music, and that mindset. Always thought I might move there one day, but life happens. Anyways it goes great with a few beers and some steaks grilling…..even though it’s about ten degrees out. Good, fair review. This one is just a bit too polished for something that I would ever listen to regularly, but hopefully this aspect of it will enable him to make big inroads in the mainstream. Also, it’s cool that he is bringing Randall King with him to the Ryman. For someone so “country” Monday Morning Merle sounded like bro country name dropping artists from other genres. Crazy how Trig only gives this album a 7.5 rating. I mean it’s great, and country, and from a major label. I would give this & Randy Houser’s newest at least a 8.5. There have been plenty of 9 or 10 album ratings over the years, but those ratings should be hard to attain, and only reserved for the very best records that will have major impact or show great innovation, or are a masterpiece. Hard to attain translation don’t be signed to a major label and have a hard time deciding what genre you wanna be. In the old days, popular radio (in whatever genre) played a variety of music. Many of the singles you liked but not enough to buy the record. You were glad to hear the song, and glad when something else took its place. But other songs would literally change your life, and you’d buy them and play them on your cheap turntable until the record wore out. I’m working through “Nothin’ to It” and for me, it’s in the first category, but I can understand how other listeners might appreciate it a lot more–it’s honest and heartfelt.It’s got lots of variety (like the old joke, “If you don’t like the weather in ___, wait five minutes and it’ll change”), but I’m not hearing any unity (though others might). There are lots of artists out there who (to my ear at least) manage to handle both variety and continuity (compare the Jackson Browne references in “Monday Morning Merle” and “Head Case”–one stays inside the song and the other reflects on the album and beyond). In these days of streaming and YouTube, when listeners cherry pick individual songs, there’s got to be a reason to release an album (or EP) other than “let’s throw these songs against the wall and see what sticks.” But if “Nothin’ to It” moves you and changes your life, that’s great. Looking forward to picking this up. I went to Walmart after work but they didn’t have it stock yet. Cody never disappoints. Based on what I have heard, Dear Rodeo is the standout for me! Hopefully he can bring his country sound back to the airwaves and get similar artists airplay, rather than the Nashville artists. ” Cody Johnson didn’t need Music Row. Music Row needed Cody Johnson.” Totally agree with that assessment, and I would also add that in order to influence the music forced on us by radio, we need Music Row to recognize this sound plus EVEN MORE country sounding is what we want. Otherwise, I’m fine not listening to the radio. I’d give this album an 8. Monday Morning Merle is a great tune and the album is good not great but solid. Cody however live is stellar and puts on one of the most authentic country music shows on the road today. Authentic is the best to describe Cody Johnson! I’m on board with most folks’ assessments ( from the few cuts I’ve heard thus far ). The only thing seemingly overlooked in the comments is that Cody Johnston is a COUNTRY SINGER. A damn FINE COUNTRY music singer . This guy isn’t even capable of singing pop and doesn’t need fake twang or exaggerated enunciation ( Church ) , inaudible mumbling ( you know who you are SS ) or , really , any more than him singing a song with just his acoustic guitar for me to feel , smell and respect the integrity in what he’s doing . The man is a COUNTRY singer and I could listen to him sing all day long just because of that fact . Mark Chestnut , Easton Corbin , Randy , Merle ,Stapleton , Joe Nichols , George Jones ,AJ ……and CODY JOHNSON . I have NO problem putting CJ in that company . Yes ….’ country music ‘ is cranking out carloads of crappy songs ….but we seldom address the fact that there are so few REAL country vocalists out there who could really sing a great write with the conviction and ‘vibe ‘ it would require . The fact that he has good to great material is almost a total bonus when a voice like that can do so much heavy lifting . I’m rooting for CJ big-time …I’m loving the fact that in the absence of the Chesnuts , the Haggards , even AJ and Mr, Nichols , country radio has found a REAL country singer who , hopefully , has a bag of great material to show off that fact . I’m loving the record. The end. Just happy to have another new album that isn’t garbage to listen to. Great, honest, in-depth review Trig. Thanks! I think he’s a superstar in the making and I couldn’t agree more with Trigger’s line about maturing at the right time. His last two albums – this one and Gotta Be Me – have been his best, in my opinion. I’m generally a fan of Cody’s and I do like the album. It’s good, solid. There are only three or four songs I would say veture into “very good” territory (“Dear Rodeo,” “Monday Morning Merle,” “Where Cowboys are King,” and maybe “Noise”). The rest is solid, good country music. I probably won’t spin this one regularly, but it is definitely a good album. It’s a beautiful thing to see, him and his crowd. I really dig the first verse of Understand Why. Third floor motel room on the dark side of the Moon is a good way to represent how you feel after heartbreak. Also, Doubt Me Now and Honkytonk Mood are gonna be big rockers live. Now that he’s considered “mainstream,” he might just be the best live mainstream performer outside of Luke Combs! High hopes for COJO. Always gonna root for him. But just too polished for me. Can’t stand the guitar that sounds like a keyboard that’s ingrained in today’s trashville sound. Name dropping Springsteen? Haven’t we had enough of that already? I’ll take it as a win that CoJo will be played over some garbage pop/r&b/edm, but it won’t bring me back to radio either. I’ve been a fan of his from the beginning and I think this album has some great stuff with some misses mixed in. Listening to it one time through, I could tell that he didn’t write most of them. I didn’t realize that he only had his hand in 2 of the songs, which explains why any long term fan of his would notice a difference. Being a long time Texas/Red Dirt country fan, we’ve seen plenty of our beloved singers go to Nashville and change. Pat Green is the best example of this. I just wish them all the success in the world and hope they take advantage of their opportunity to cash in while they can…then I go out to a honky tonk locally and listen to someone else. I’ll keep listening to his old stuff and a couple of the new songs. I’ll still see him live as well because his shows are electric. See him if he comes your way because you won’t regret it. Cool, I love “Monday Morning Merle”. Thanks for posting it!